Qualified yacht designers & naval architects, with more than 70 years of experience. Specialized in comfortable performance yacht designs for custom build, serial production or do it yourself. With a choice of building materials: G.R.P., composite, wood, aluminium and steel. An excellent range of stock plans. Web Site Snapshot: If available, above is a snapshot of the Van de Stadt Design web site at http://www.stadtdesign.com as it appeared when this site was added to the directory or last verified. 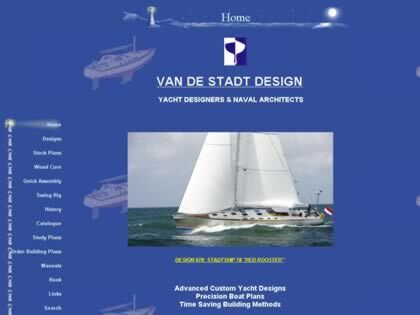 Please Note that Boat Design Net has no involvement with the above web site; all content and images depicted in the above thumbnail are the property and copyright of Van de Stadt Design unless otherwise noted on that site. Description: Qualified yacht designers & naval architects, with more than 70 years of experience. Specialized in comfortable performance yacht designs for custom build, serial production or do it yourself. With a choice of building materials: G.R.P., composite, wood, aluminium and steel. An excellent range of stock plans.